Caboolture is too great a place to be ruined by the sight of junk automobiles polluting people’s front lawns. Our Auto Wreckers Caboolture crew at QLD Wreckers are here to make sure this never happens. If you have an old rusted out bucket that doesn’t run anymore and is completely useless, then it is strongly advised that you call us immediately, as we will come to your house and buy it off you. We buy vehicles of all shapes, sizes and condition. Whether it’s a 4WD, truck, car, Ute, SUV or van, we will buy it. If you would like a cash quote at no cost to you, call us. The number is 07 3393 9929. There is also a form on our website you can fill out if you really don’t like phones. Our targeted turnaround time is within 24 hours or sooner. Every now and then an auto needs repairs. If you are repairing a vehicle, you may find that a part needs replacing. It is always advised that buying a part brand new is never the answer. This is because brand new parts are very expensive. If you want to do this the economically pragmatic way. You will buy the part second hand. It will be just as good. However it will also be affordable. We have a wide selection of second hand parts. As a result of all the vehicles that we have been purchasing over the years. The inventory range is so extensive that if you are looking for a specific part. You will probably find it, with the help of one of our extremely talented and friendly team. And it will be in great condition as well. The service we provide is also great for the planet. How is this? First of all, the climate change that is occurring right now is because of carbon dioxide. A lot of carbon dioxide is released as a result of the mining process, used to get the raw materials that make up steel. By recycling steel we are minimising the reliance manufacturing industries have on new steel. Recycling uses up less energy than mining, meaning less carbon dioxide is released as a result. If you are worried about climate change, you are right to be. It is pretty much settled science by now. With ninety seven percent of the scientific community being in consensus. Also, we dispose of any and all toxic materials that happen to be part of your vehicle. If you don’t have your car recycled. These materials will leach out into the ground and harm the environment that way. You don’t have to lose any sleep over whether your car is harming the planet any more than it already has. There is good news for all the folk who are worried that we won’t buy their vehicle off them because it is a make or model that is incredibly unpopular. This would be a hindrance when selling via the normal channels, but when you are selling to us here at QLD Wreckers, it will only effect the amount of money we pay. Not the likely hood that we will buy it off you in the first place. We are proud of our inclusive attitude when it comes to vehicles of different makes and models. We are happy to purchase them all. And will not turn any down just because of the brand name. This means we buy Mitsubishi, Holden, Isuzu, Hyundai, Daihatsu, Toyota, Mazda, Ford, BMW, Chrysler, Tesla, Lexus, Subaru, Chevrolet, Peugeot, Mercedes Benz and even Jeep. As a leading Cash for Car Company in Caboolture, we never say no to all Japanese, European, American, Korean or classic trucks, vans, Utes or 4x4s. Not to mention anywhere else in Caboolture, we will be there for you if you call. It really is harder to sell a wheels privately that doesn’t run, but how else are you going to get rid of it? By selling to us! We won’t reject your vehicle because of its condition no matter how bad it is. Why is this? Because we make money from recycling automobiles, and all cars have at least something that can be salvaged, even if it is just the steel. We buy junk wheels for a living. We recycle those junk automobiles so that the steel and parts can be used again. There is no such thing as a junk auto that is in good condition. So it really does go without saying that we will not turn down a junk car because it is in bad condition. When you sell your truck to us, be rest assured that you are being paid more for it than you would be if you were to sell to any of our competitors. We pay the most for used, old and unwanted automobiles in town. Our team of highly skilled professionals have a heavy bias toward top dollar when they are in the process of estimating the value of a car. This means that you will get top cash. Depending on the make, model, age and condition your vehicle is in, you will get up to $9999 for your vehicle. 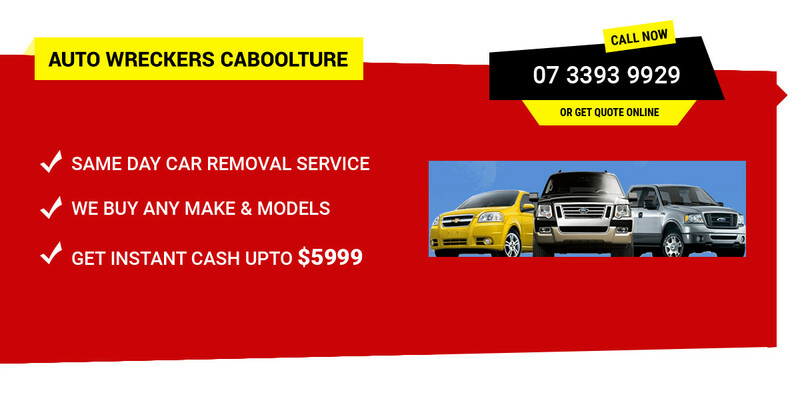 Our Auto Wreckers Caboolture crew propose the fastest and the reliable way to sell your unwanted cars for cash. Know more about Qldwreckers. Nobody can beat the stack of money we offer because we love to do the price match for all genuine figures. Feel free to get an instant quotation for your vehicle today and enjoy the sum of cash for your next vehicle.